There have been a number of histories of Yorkshire County Cricket Club over the years. No other county has won the Championship so many times (33), nor produced such an array of great players. It has always struck me as odd in those circumstances that all of the books there are seem to be around the same size, whether that be RS Holmes 1904 effort, or Derek Hodgson’s from 2009. They must become ever more diluted is the only conclusion I can come to. Fortunately Jeremy Lonsdale’s reader is not presented with just another history of the White Rose, nor even anything remotely like what has been seen before, so whilst this is a history of cricket in Yorkshire it is very much a specialist publication. 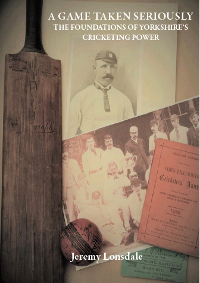 In the book Lonsdale looks at what created the cricketing phenomenon which, from 1893 onwards, was to be the dominant side in county cricket for almost 80 years. The County Championship was properly organised for the first time in 1890, but before that the naming of a champion county was something that had been done for more than twenty years. The powerhouses of English cricket in those days were in Nottinghamshire and latterly, with the coming of the Graces, Gloucestershire. The back story of how Yorkshire came supplant them is the subject Lonsdale tackles. There is a defined starting point and an end point for the book. It concludes with that first Championship in 1893. The start, 1822, was when the first commercially operated cricket ground in the county was opened, in Sheffield. The resource that has made the book possible is the British Newspaper Archive. There are as many as 1,841 references within the text. Personally I would have preferred those to have appeared as footnotes rather than take up thirty pages at the back of the book, but that is a minor inconvenience, as I won’t be setting out to check all those sources. Inevitably much of the book is concerned not just with the game of cricket but with the social history of nineteenth century. Life was not straightforward then, nor was the game of cricket. As anyone who has played there knows the local leagues in Yorkshire are a hard school and their development is the key to the county’s subsequent success. A Game Taken Seriously is a revealing look at how cricket in Yorkshire developed with much material that, by nature of its source, has not seen the light of day since it was originally published back in the 1800s. I won’t pretend that the book will appeal to the casual cricket fan, but then that is no measure of quality, and indeed as a general rule cricket books that do appeal to a wider audience are rarely amongst the best. For those interested in how the game developed in the Broadacres and its main characters the book is invaluable. Those who are not will doubtless give it a miss, but even then if they ever see a copy I would recommend they take a brief look anyway, as the selection of well reproduced photographs that Lonsdale has chosen is a fascinating one.